Possibly my favourite in-n-out restaurant around. Matsuya is one of the largest fast food chain restaurants in the country and can be found all over Sapporo Japan, especially in the central places of Odori, Susukino and Sapporo Station. They have a good menu and everything can be ordered by a vending machine with pictures of the dishes located next to the buttons. So, no Japanese required. This is convenience at its best. Decide what you want to eat, insert your money, press the corresponding button, take your ticket, choose somewhere to sit, a server takes your ticket, receive your food, and eat. Done. In-n-out in about 15 minutes. What I like about this top restaurant chain is that a bowl of miso soup comes with every order, making it not the healthiest fast food, but it definitely makes you FEEL that what you are eating is healthier. 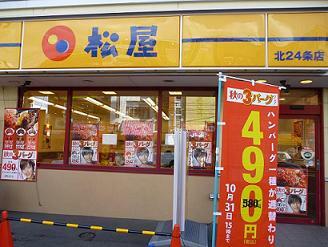 There are always special deals going on every month such as 100 yen off a dish or a new dish that they are promoting. For example, one month they had the “Hamburg Fire” campaign. This was hamburg steak (a hamburger patty) with a special sauce on top accompanied by a bowl of rice, mixed salad and miso soup. All for just 490 yen! Usually the price is 590 yen. 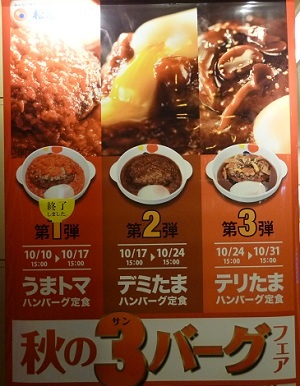 During this campaign every week they would have a different kind of hamburg steak dish. In the first week was hamburg steak in tomato sauce with a half cooked egg on top. The next week was hamburg steak with a meaty gravy on top and a half cooked egg and the final week was hamburg steak with mushrooms and……..you guessed it, a half cooked egg. The Japanese love their raw and half cooked eggs. The menu does vary from time to time but below are the regular dishes. You also have side menu options such as salad, extra rice, a raw egg, natto (fermented bean curd) etc. If you want to have take out, after taking your ticket from the vending machine go to the small section near the kitchen that says ‘take out’ and say “o mochikaeri de” (take out). 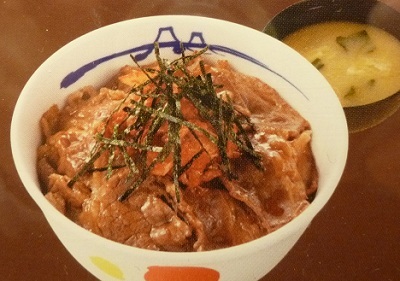 This is a bowl of rice with strips of beef on top and comes in medium or large. There are also other variations that you can choose from. You can have extra kimchee (Korean spicy cabbage) on top or you can have an extra egg (raw or half cooked) or you could have both. It’s up to you. 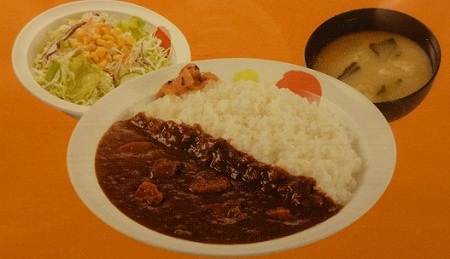 There are a variety of curry dishes available. Plain rice with beef curry sauce (original curry), rice with beef curry with an extra portion of shredded beef on top (the same beef from the Gyudon dish) and tomato curry and rice. Exactly what is says. 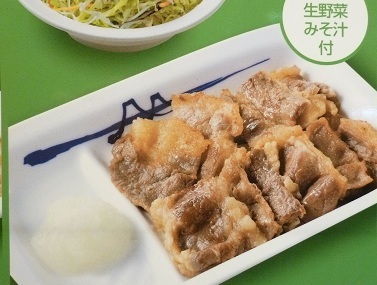 Beef or pork cut into strips with a tiny bit of radish on the side accompanied with a bowl of rice. A hamburger patty with a special sauce accompanied with a bowl of rice. There is usually at least one kind of hamburg steak dish available. Breakfast is available from 6am until 10am and is great value for money. 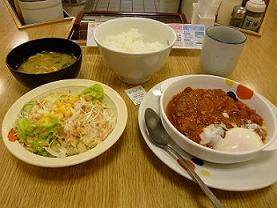 The Japanese have a huge breakfast and it normally consists of about 5 or 6 dishes. There are a variety of set breakfasts. The one pictured above has rice, natto, pickled cabbage and vegetables, miso soup, spring onions, crispy seaweed and………that’s right, a raw egg. 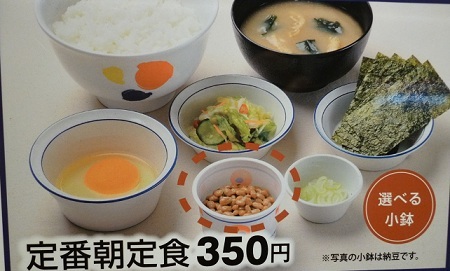 All of the above dishes will cost you anywhere between 300 yen and 700 yen. Great for people on a budget, filling and better than the Mcdonalds menu. Perfect if you just want to get in-n-out as there is never a wait for seating because of the efficiency of the system. I recommend the hamburg steak with meat gravy and mushrooms set meal. Bargain!